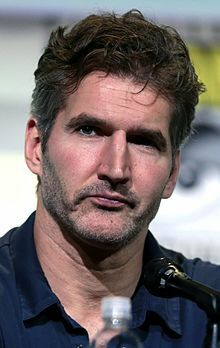 David Benioff (/ˈbɛniɒf/; born David Friedman /ˈfriːdmən/; September 25, 1970) is an American screenwriter, television producer, writer, and novelist. He is the co-creator and showrunner of the widely acclaimed award-winning HBO series Game of Thrones. Benioff was born David Friedman in New York City, to a Jewish family with roots in Austria, Romania, Germany, Poland and Russia. He is the son of Barbara (Benioff) and Stephen Friedman, who is a former head of Goldman Sachs. He is a distant cousin of Marc Benioff. As an adult, he uses the last name Benioff, his mother's maiden name, to avoid confusion with other writers named David Friedman. He is the youngest of three children (Suzy, Caroline, and David) and grew up in Manhattan, first in Peter Cooper Village, then on 86th Street where he spent most of his childhood, before eventually moving near the U.N. headquarters when he was 16. Benioff is an alumnus of The Collegiate School and of Dartmouth College. While at Dartmouth he was a member of Phi Delta Alpha Fraternity and the Sphinx Senior Society. After graduating in 1992, he worked in a number of jobs: for a time as a club bouncer in San Francisco, and as a high school English teacher at Poly Prep in Brooklyn, New York City for two years, where he served as the school's wrestling coach. Benioff became interested in pursuing an academic career and went to Trinity College Dublin in 1995, for a one-year program to study Irish literature. While in Dublin he met D. B. Weiss, who would later become his collaborator. Benioff wrote a thesis on Samuel Beckett while at Trinity College, but decided against a career in academia after writing the thesis. He worked as a radio DJ in Moose, Wyoming for a year—mostly as a side job, which he mainly accepted to take a year in the countryside as a writer's retreat. He then applied to join the Creative Writing Program at the University of California Irvine after reading The Mysteries of Pittsburgh by Michael Chabon (an alumnus there), and received a Master of Fine Arts degree in creative writing there in 1999. In 2001, People magazine included Benioff on its list of America's Top 50 Most Eligible Bachelors. Benioff spent two years writing his first published novel The 25th Hour, originally titled Fireman Down, and completed the book as his thesis for his master's degree at Irvine. He was asked to adapt the book into a screenplay after Tobey Maguire read a preliminary trade copy and became interested in making a film of the book. The film adaptation, titled 25th Hour and starring Edward Norton, was directed by Spike Lee. Benioff then wrote a collection of short stories titled When the Nines Roll Over (And Other Stories) (2004). He drafted a screenplay of the mythological epic Troy (2004), for which Warner Bros. pictures paid him $2.5 million. He also wrote the script for the psychological thriller Stay (2005), which was directed by Marc Forster, and stars Ewan McGregor and Naomi Watts. His screenplay for The Kite Runner (2007), adapted from the novel of the same name, marked his second collaboration with director Marc Forster. Benioff was hired in 2004 to write the screenplay for the X-Men spin-off X-Men Origins: Wolverine (2009). He based his script on Barry Windsor-Smith's "Weapon X" story, Chris Claremont and Frank Miller's 1982 limited series on the character, as well as the 2001 limited series Origin. Hugh Jackman collaborated on the script, which he wanted to be more of a character piece compared with the previous X-Men films. Skip Woods was later hired by Fox to revise and rewrite Benioff's script. Benioff had aimed for a "darker and a bit more brutal" story, writing it with an R rating in mind, although he acknowledged the film's final tone would rest with the producers and director. In 2006, Benioff became interested in adapting George R.R. Martin's novel series, A Song of Ice and Fire, and began working with D. B. Weiss on a proposed television series, Game of Thrones. The pilot, "Winter Is Coming", was put into development by HBO in 2007 and the series greenlit in 2010. Benioff and Weiss act as the executive producers, showrunners, and writers of the show, which began airing on HBO in 2011. Benioff and Weiss had previously worked together on a script for a horror film titled The Headmaster, but it was never made. In October 2007, Universal Pictures hired Benioff to write an adapted screenplay of the Charles R. Cross biography of Kurt Cobain, but the screenplay was not used. In 2008, Benioff's second novel, City of Thieves, was published. On April 10, 2014, Benioff announced he and Weiss had taken on their first feature film project to write, produce, and direct Dirty White Boys, a novel by the Pulitzer prize-winning author Stephen Hunter. On July 19, 2017, Benioff announced that he and Weiss are going to begin production on another HBO series, titled Confederate, after the final season of Game of Thrones. Benioff and Weiss said, "We have discussed Confederate for years, originally as a concept for a feature film, but our experience on Thrones has convinced us that no one provides a bigger, better storytelling canvas than HBO." On February 6, 2018, Disney announced that both Benioff and Weiss will write and produce a new series of Star Wars films after the final season of Game of Thrones is completed in 2019. Benioff and D. B. Weiss together directed two episodes of Game of Thrones, but used a coin-flip to decide who would get the credit on the show. Benioff was given the credit for Season 3 episode 3, "Walk of Punishment", while Weiss was credited with season 4 episode 1, "Two Swords". Benioff and Weiss will co-direct the series finale. On September 30, 2006, Benioff married actress Amanda Peet in New York City. Together they have three children. The family lives in Manhattan and Beverly Hills. Directed and wrote episode: "Walk of Punishment"
2013 It's Always Sunny in Philadelphia Yes Wrote episode: "Flowers for Charlie"
^ a b Kamin, Debra (May 20, 2014). "The Jewish legacy behind 'Game of Thrones'". The Times of Israel. Retrieved March 28, 2016. ^ Bloom, Nate (February 2, 2012). "Jewish Stars: genealogy and fairy tales". Cleveland Jewish News. ^ "Deaths: Benioff, Florence". The New York Times. August 28, 2000. Retrieved March 28, 2016. ^ Bort, Julie (April 12, 2015). "How these famous Benioffs are related". Business Insider. Retrieved March 28, 2016. ^ Alden, William (March 19, 2014). "Former Goldman Chief Walks Among Warriors and Dragons". DealBook. ^ cityfile. "Stephen Friedman". gawker.com. Retrieved 19 March 2018. ^ "Novelist and Hollywood Personality David Benioff: He's a Former English Teacher". Chalkboard Champions. December 18, 2013. ^ Ellis, James (October 27, 2009). "David Benioff". Metro. ^ Gottlieb, Jeff (September 2, 2002). "Program Gives Writers a Professional Polish". The Los Angeles Times. ^ a b Katie Kilkenny (May 12, 2011). "Benioff '92 embraces storytelling in 'surreal' career". The Dartmouth. ^ "America's Top 50 Bachelors". People. ^ Jalon, Allan M. (May 13, 2001). "How to Write a Powerful First Novel in a Bland Age". Los Angeles Times. ^ Gottlieb, Jeff (December 2, 2002). "His Finest Hour". Los Angeles Times. ^ "Crowning achievement". UCI News. August 12, 2014. ^ a b Benioff, David (May 3, 2003). "One more hour". The Guardian. ^ "Q: What do Brad Pitt, Spike Lee and the Iliad have in common? A: David Benioff, Hollywood's latest wonder kid". Herald Scotland. March 29, 2003. ^ Stephenson, Anne (August 30, 2004). "Screenwriter's short stories shine". USA TODAY. ^ "Novelist and Hollywood Personality David Benioff: He's a Former English Teacher". Chalkboard Champions. December 18, 2013. Retrieved March 28, 2016. ^ a b Mishler, James (June 2005). "David Benioff, Screenwriter of Wolverine: He's One of Us". Comics Buyer's Guide: 18–20. ^ Mitchell, Elvis (May 8, 2013). "UpClose: Game of Thrones with David Benioff and D.B. Weiss (FULL LENGTH)". KCRW. AVMedia. Retrieved May 15, 2013. ^ Rosenberg, Adam (April 5, 2010). "Kurt Cobain Biopic 'In The Works,' 16 Years After His Death". MTV News. Retrieved March 28, 2016. ^ Fleming, Mike (April 10, 2014). "'Game Of Thrones' David Benioff & D.B. Weiss Plan 'Dirty White Boys' As First Movie". Deadline Hollywood. Retrieved March 28, 2016. ^ "The 2003 Pulitzer Prize Winners (Criticism)". Pulitzer.org. Retrieved 24 April 2014. ^ Messer, Lesley; Herbst, Diane (September 30, 2006). "Amanda Peet Weds Screenwriter Beau". People. Retrieved April 9, 2011. ^ "Amanda Peet Welcomes a Baby Girl". People. Retrieved 19 March 2018. ^ a b c Saad, Nardine. "Amanda Peet, 'Game of Thrones' producer David Benioff welcome baby boy". Los Angeles Times. Retrieved 19 March 2018. ^ "Amanda Peet Has a Girl". People Magazine. February 23, 2007. Retrieved November 4, 2007. ^ "Amanda Peet & David Benioff Welcome Baby No. 3: Henry". celebritybabyscoop.com. 8 December 2014. Retrieved 19 March 2018. ^ Catherine Bell, on Catherine Bell Introduces Son Ronan. "Amanda Peet Welcomes Daughter Molly June – Moms & Babies – Moms & Babies". Celebritybabies.people.com. Retrieved February 11, 2011. ^ "2012 Hugo Award Winners". the hugoawards.org. World Science Fiction Society. September 2, 2012. Archived from the original on September 3, 2012. Retrieved April 12, 2017. ^ "2013 Hugo Award Winners". thehugoawards.com. World Science Fiction Society. September 1, 2013. Archived from the original on September 23, 2013. Retrieved April 12, 2017. ^ "2014 Hugo Award Winners". thehugoawards.com. World Science Fiction Society. August 17, 2014. Archived from the original on August 17, 2014. Retrieved April 12, 2017. Wikimedia Commons has media related to David Benioff. "Excerpts: City of Thieves". bookbrowse.com.